We love growing crystals! 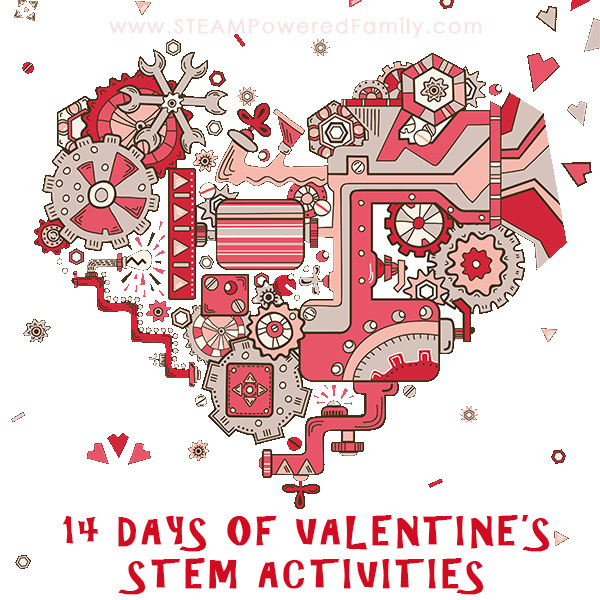 They are a wonderful STEAM activity that kids love doing over and over again. 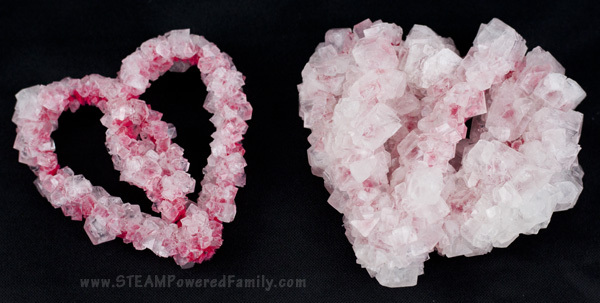 From beautiful, glittering crystal wreath ornaments to creepy crystal spiders and ghosts at Halloween, growing crystals is always fun and fascinating. But we’ve done it before. And my kids are getting older. 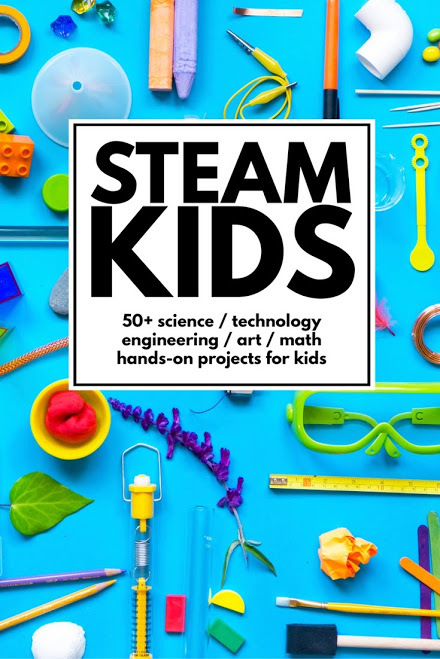 They need their STEAM activities and challenges to grow with them. So for this experiment our goal was not just to grow cool crystals but to learn what variables would grow REALLY BIG CRYSTALS! In the past, we have talked a lot about crystallization as part of our amazing Candy Science studies. 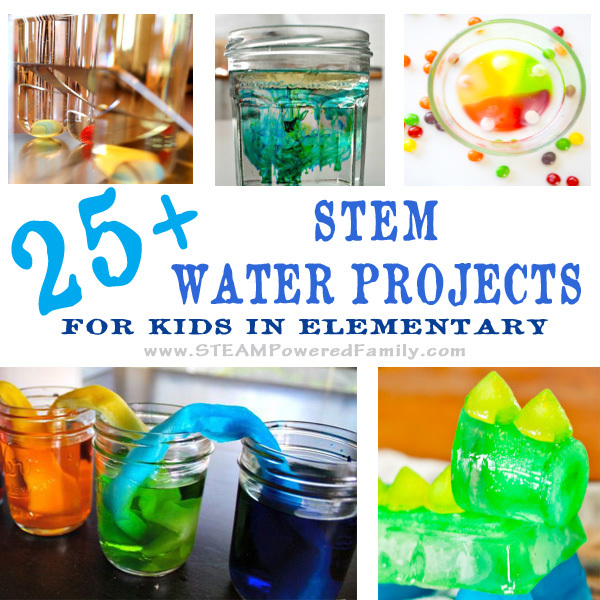 Delicious and sweet, science and STEAM goodness! Our experiment on growing big crystals was important because the results gave us some important information to help us grow some wonderful, big, beautiful rock candy crystals too. Crystal formation is governed by certain rules and variables, regardless of their starting point: borax, sugar or magma (to form gemstones). 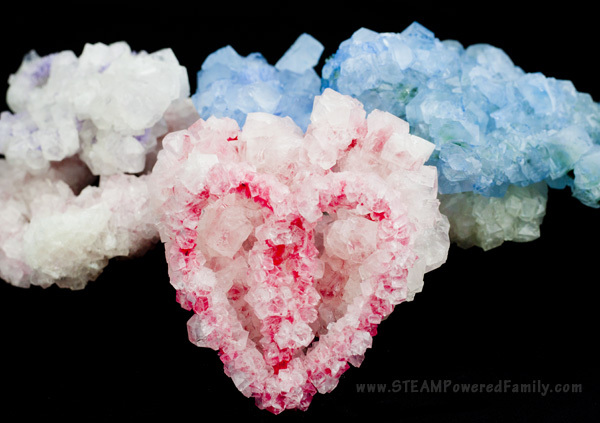 For this experiment we made giant crystal hearts. 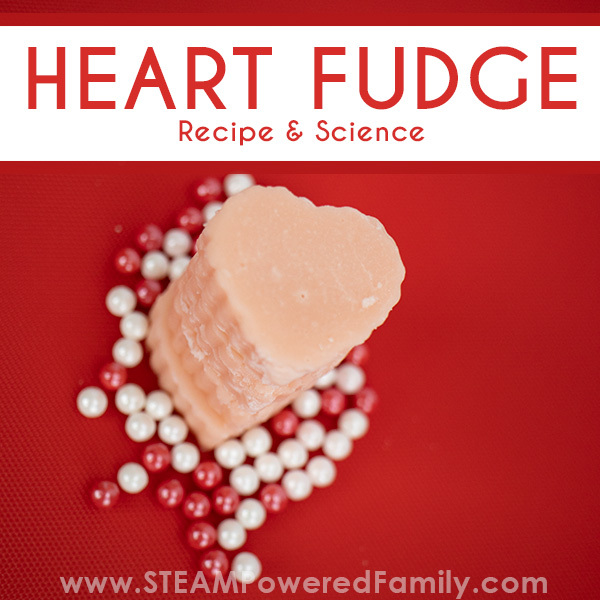 As part of your lesson you can explore how this type of crystallization differs from when we made our heart fudge recipe. 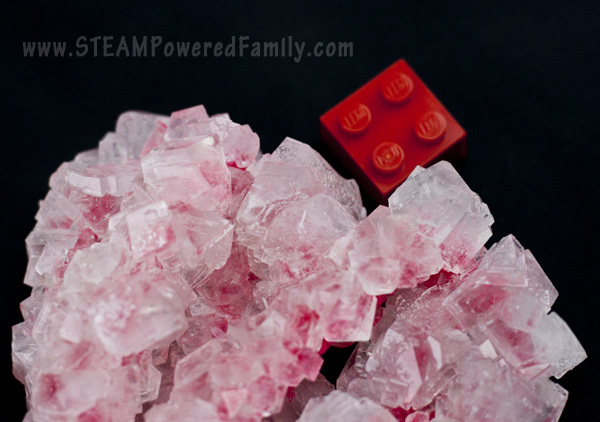 You can also compare it to our rock candy and geode candy recipes. Crystallization can be beautiful and delicious! It all depends on the circumstances. Caution: Borax can be harmful if it comes into contact with eyes, inhaled or ingested. It may also irritate skin. These experiments are not to be done with small children and protection is recommended including safety glasses, gloves and even a face mask to prevent irritation. During our experiments I alone worked with the borax powered, adding it to the water to create our solution. All other aspects the children were able to be active participants. Safety always comes first. First, build your shapes from the pipecleaners. We went with some hearts plus some fun, abstract designs. You want to keep the gaps to no more than a small finger width. This will help in crystal formation. Once your shape is created attach it to your skewer using the fishing line. You want it to hang low enough that it will be completely submersed in the water but not so low that it touches the bottom. Depending on the size of your pot you may be able to string two or three designs. Just make sure they don’t touch each other or the sides of the pot, or while growing your big crystals, you will end up with them becoming attached. Fill your large pot with water. You want it about an inch from the top. If you want to add food colouring to get coloured crystals, mix it into the water now. Set it on the stove and bring it just to the boiling point. Don’t let it get into a full bubbling boil, it could splash and hurt someone. Adjust the heat to keep it at a gentle simmer. Start adding borax powder. 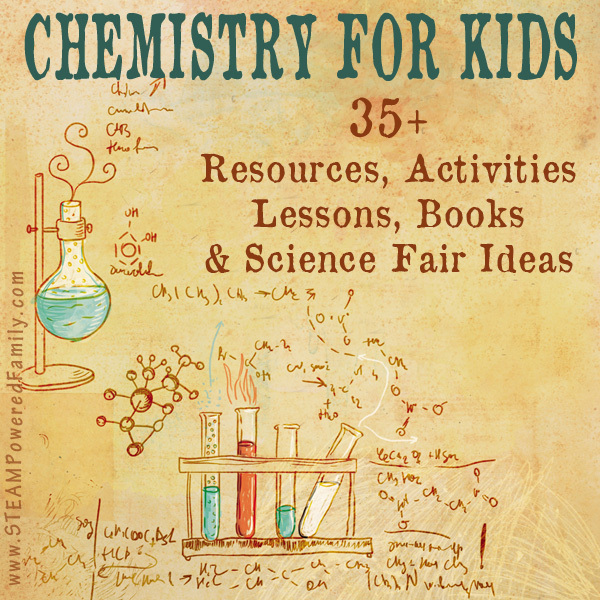 Your goal is to create a super-saturated solution. To do this continue adding borax, stirring until it dissolves, then add more. You will use a lot of borax. It took almost a full box for our experiment. But the good news is that you can reheat the crystallization solution and use it over and over again. You will know once you have hit super-saturation of the solution because some borax will remain at the bottom of the pot and won’t dissolve. Place the skewer across the top of the pot so the pipe cleaner figures are completely submersed. You may need to jiggle them a bit to get any air bubbles off. Place the lid across the top, it will not close tightly. Place a sheet of tinfoil over the top to trap in the heat escaping from the gaps. Once the element has cooled, you can add a tea towel to the top. The goal is to keep that heat in as long as possible. You want it to cool REALLY slowly. Trivia of the day: In blacksmithing this is called annealing. Don’t peek for at least 24 hours. After 24 hours, if it is completely cool, you can remove your creation. If it’s still warm, cover and let it sit longer. 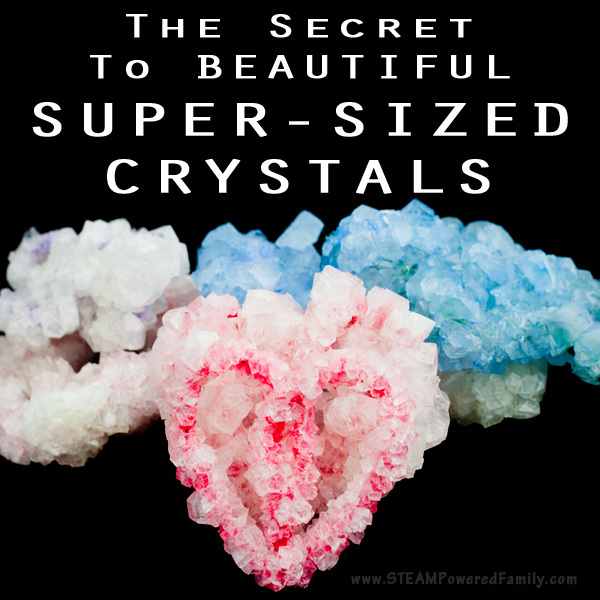 Have you figured out the secret to really big crystals? It’s making the solution cool as slowly as possible. 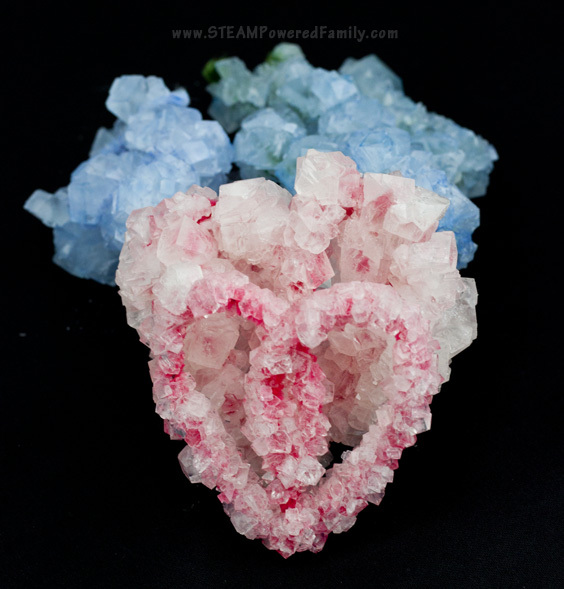 Heat is the secret weapon to creating big crystals, whether it is from borax or rock candy. We created crystals that were almost the size of a 4 piece Lego brick! It’s one thing to say they are big crystals, but since we were doing this as a science experiment we needed a control. So we made two identical heart pipecleaner shapes. Once went through the method above, while the other went through the crystal growing process we used in the past. You can find the details on that one here. What if you want even more or bigger crystals? Perhaps you want even more crystals or want to try for bigger crystals, or maybe the kids pulled it out too soon. It’s OK! Reheat the solution. Take your crystals you just made and submerse them in the solution again for another round of crystal forming. If you are like me and have health issues that are triggered by Borax or live in a country, like Canada, that advises against using Borax around kids, or work in a school district that bans the use of Borax in the classroom, there is another option! 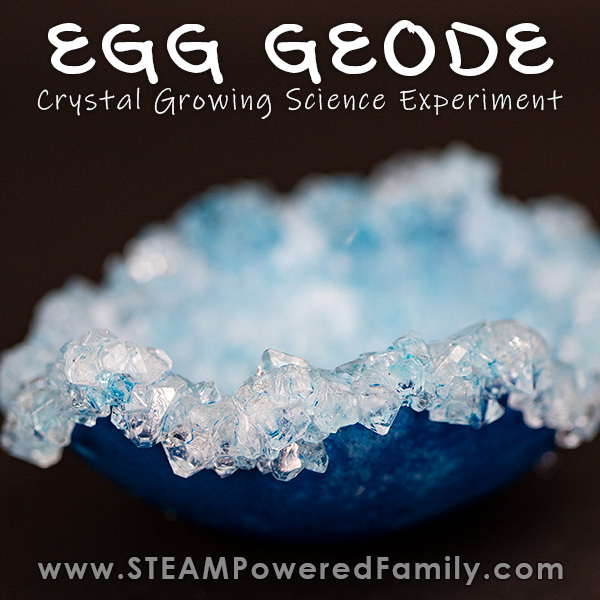 We had great success growing our crystals using alum in this Crystal Egg Geode experiment. Now it was -40 out and cold and I didn’t really spend the time testing to see if the same concepts work to grow really big alum crystals, but I suspect the process should be same. If you give it a try, let me know how it turns out! Enjoy growing big crystals now you know the secret!